In my everyday home life I’m a very sedentary soul. Of course I go places, my current daily work commute between North London and New Malden not to mention pootling around to visit family and friends. But I don’t walk much, as both my day job and this blog require a lot of desk time. When I’m travelling, I’m a totally different animal and I love nothing more than to explore new places, and to get out there and see all the sights. Our travel style is still fairly gentle – we don’t try and cram too much into each day, giving ourselves time for leisurely meals and coffee stops, and to sit and observe and enjoy. But for us, a holiday is very much about getting out to see the world and finding all those ‘elsewheres’. We aren’t sunbathers but a sunny blue sky is always a bonus! This beautiful autumnal scene was taken in Portugal’s wonderfully gastronomic Alentejo region earlier this year; at this moment, I was standing on the terrace of one of the many modern wineries looking out over their vineyards and surrounding fields. You are welcome to save or share this via Pinterest, Facebook, Twitter or Instagram but please do not edit the image or crop out the attribution text. 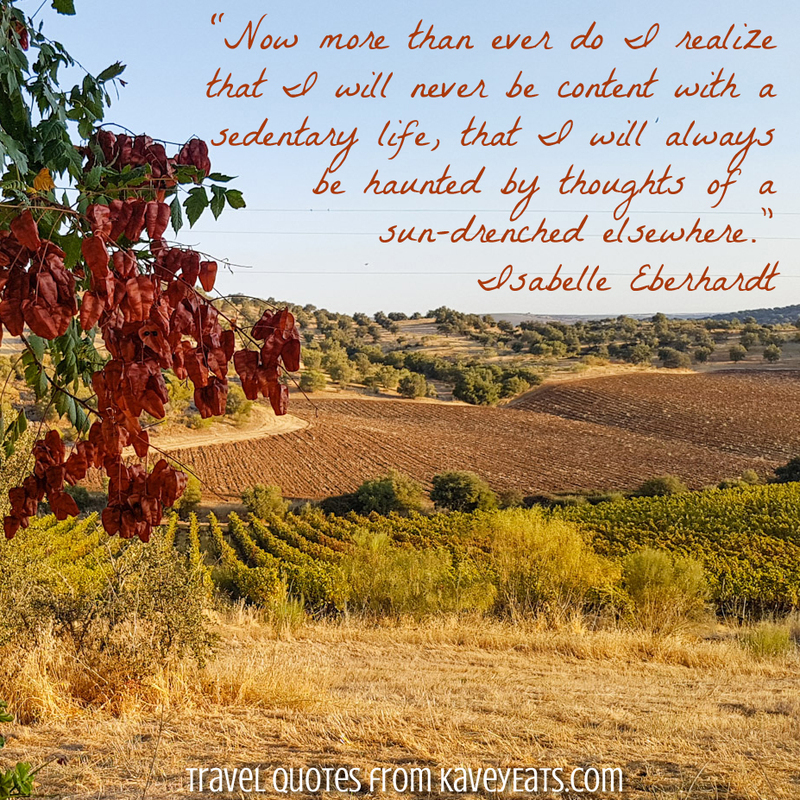 35 Comments to "Travel Quote Tuesday | A Sun-Drenched Elsewhere"
I can totally relate to this. Sometimes I think I just want to rest and then I get wanderlust. Those of us who have this trait are united by brotherhood/sisterhood forever. Others just think we are crazy. Yes, I know what you mean, what with a desk job at work, and time spent at my desk at home to blog, it’s certainly more sedentary than is ideal! If you love to be sun-drenched you can always visit Singapore! I visited once for a day! Ooh intriguing, I have travelled to some colder places and I love the snowy landscapes, but I still want it to be sunny… I don’t mind it being cold though! I hear you on that one. I am all about finding those elsewheres. Thanks for sharing. Same for us, when we are at home we love to just feel lazy and enjoy the coziness of our place, when we’re on the road we can’t stay still! I love that quote! And we have pretty much the same travel style as yours – we do like to explore a lot yet leave enough time for leisurely coffees and meals. Sometimes just walking around, getting lost, finding hidden places, is so amazing. When I’m back home, I probably am the laziest person. I love coming back home from work and just relaxing everyday. But this routine has to be broken by frequent travels! Yes, that’s very much like us! What a great quote, I hadn’t seen that one before. A sentiment shared amongst kindred spirits for sure! Haaa, I can do that for a fairly long stretch but I do start missing home after a while!! This is us for sure, after travelling for 18 months we returned home from Christmas and despite it being great to see everyone and see home, we realise even more that we can’t just stay here! I would love to travel for more extended periods and need to work out how best to make that happen! I can understand what you mean. While at home I am the same as you are, when I travel I feel more energetic, I dunno why, maybe we are a human being with a nomadic DNA. I am glad it’s not just me! Am escaping today for warmer climes, for a whole three weeks! Yes, that’s very astute, I think that is a big part of it. Such a great quote! Now that I’ve explore a little bit of the world, I’m just itching to continue exploring. I don’t think I can ever live a still life ever again. There’s so much to get up and see! Yes, so very much and our lives whizz past so fast! Though I love this quote because it definitely describes me, I often wonder if it worries Darcee that “I realize that I will never be content with a sedentary life” because I know she would love to settle down one day while if I had it my way, I would leave and never return if possible. In my world it is slightly different too because I live in New Orleans where there is always something going on thus I am not sedentary at all but even an active home life can become rote and monotonous. I guess that is why I love travelling. It is constantly moving and evolving. We’ve never travelled long term so we’re kind of settled but with constant itchy feet, which works for us but I would like to do some slightly longer trips (2-3 months) at a time if we can make it work. It’s so important to take in the surroundings on travels without hurrying from one place to the other. Many travelers have bucket lists and cram as much places into their holidays as possible. We don’t. Like you we enjoy to sit and watch, observe the everyday life in another country with curiosity.